in the core (e.g. via fusion), the other force SEPARATES parts of the atomic core. It produces the radioactivity of e.g. uranium and thorium (table). e.g. it forms stars from huge clouds. It holds together stars, solar systems, binary stars, galaxies, clusters. 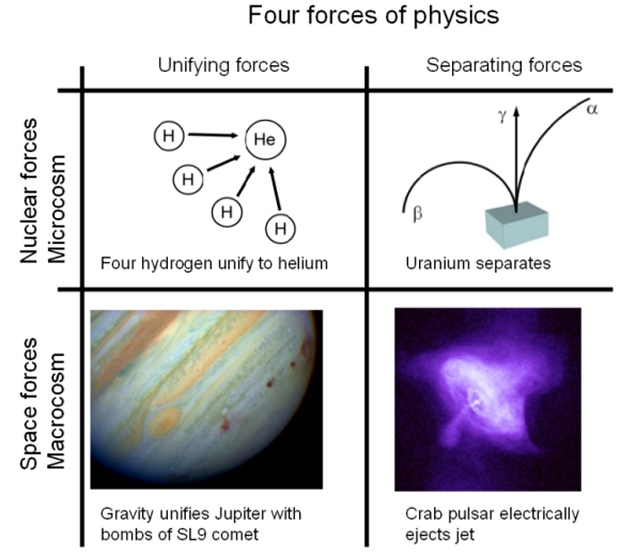 The other force - the electric force - SEPARATES matter of celestial bodies and produces winds, loops, flares and lightyears-long jets. The electrically ejected matter is formed to filaments via pinch effect. The attractive and repulsive forces in microcosm and macrocosm show the elegant simplicity and beautiful symmetry of the Universe. This was not understood in the 20th century. The main problem was, how could the Universe still have e.g. positive matter which should eject another positive matter as the Sun its proton-flares? Yes, positive and negative matter continually neutralise each other. But the sun-like stars continually produce new charged matter, too, e.g. negatively charged wind and proton-flares. They do it via 43 times quicker thermal motion of the plasma-electrons related to that of the protons (Eddington 1925). Therefore, electron-jumps outwards are in average longer than those inwards. In addition to this thermoelement-effect, the solar photons and the solar neutrinos also push outwards the electrons to longer jumps but the ions to shorter ones. The solar surface is charged negatively. Neutron stars and black holes have more violent electric functions. This is shown in the book and in the homepage of "The Electric Universe". peered beneath the stormy surface of our star. NASA has made a nice simulation to this issue which can be viewed here on the their website. Read my script to this discovery, which was send to newsletter-readers earlier.